Why give your students generic handouts that they'll never look at again? 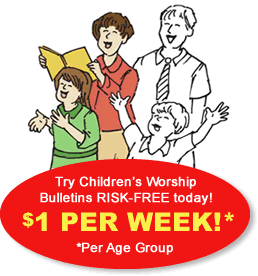 With Children's Worship Bulletins, you can uniquely customize your bulletins so that your kids take home a relevant, educational reminder of their activities in Sunday school. Include your church's name, contact information, pastor's name and your church's logo so that kids and their parents have a ready reference to your church. Too often, kids can't remember what they did in Sunday school by the time they're in the car and headed home. With Children's Worship Bulletins, it's easy to create activities that make Sunday school memorable. In this short article, we've provided two Sunday school bulletins about Job to help you make your class memorable. Your kids will be excited to tell their parents about what they learned! Sunday school activity about Job for ages 3-6: Job said, "My feet have followed God's steps ... "
Explain the activity, "While I read our Bible lesson, solve the puzzle 'Job said, "My feet have followed in God's steps … " Have them color the correct path to "God's Way" blue and the remaining footprints any color they choose. Read Job 23:1-17 while the children solve the puzzle and color Job's footsteps. Sunday school activity about Job for ages 7-12: How does Job's story end? Explain the activity, "When I say, 'GO!' complete the puzzle 'How does Job's story end?' Cross out each letter that appear five or more times. Then, circle all of the remaining letters in the puzzle. Place those remaining letters on the lines provided in the same order as they appear in the chart. The first person to complete the puzzle and write down the answer will win." Yell, "GO!" and wait for the first child to finish. Check the winner's puzzle solution to "The Lord blessed Job's life". (Q=5, N=5, P= 5, G=5). Read Job 42:1-17 to reinforce the story. Just like the examples in this short article, each bulletin is full of Bible-based puzzles, word searches, seek-and-finds, dot-to-dots and many more activities that children love. For convenience, your subscription to Children's Worship Bulletins is continuous — you'll receive a weekly bulletin that follows either a Scripture plan or your choice of lectionary. Sunday school planning couldn't be easier than having fun, educational and meaningful bulletins regularly delivered directly to you!